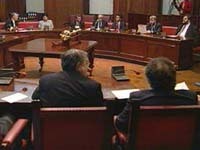 The Gibraltar Parliament in session. 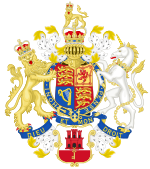 Her Majesty's Government of Gibraltar is the democratically elected government of the British Overseas Territory of Gibraltar. The government has Queen Elizabeth II (represented by a governor – currently, Edward Davis) as its head of state. 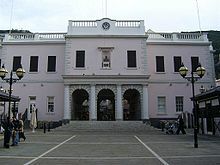 Elections in Gibraltar are held every four years, with a unicameral parliament of 18 members (17 members elected by popular vote and, the "Speaker" – currently, Adolfo Canepa, appointed by Parliament). The terms are also four years. The leader of the majority party (or majority coalition) is formally appointed by the governor as the Chief Minister (head of government). The Cabinet (Council of Ministers) is generally formed by 10 of the 17 elected Members of Parliament, through choice made by the Chief Minister with the approval of the Governor. The seven remaining members constitute the Opposition (Shadow Cabinet). The last general election was held on 26 November 2015. ^ a b c Central Intelligence Agency (ed.). "Gibraltar". The World Factbook. Retrieved 2012-09-14. ^ Isolas Gibraltar Lawyers (ed.). "Gibraltar Parliament". Retrieved 2012-09-14. ^ "Chief Minister reshuffles the Cabinet (HM Gov't of Gibraltar 'Press Release')" (PDF). This page was last edited on 8 February 2019, at 06:03 (UTC).